The unusual fossil above was collected by Megan Innis (’11) and myself in Mississippi during a May 2010 paleontological expedition with Caroline Sogot and Paul Taylor of The Natural History Museum, London. That splendid trip has contributed already to one high profile publication (Sogot et al., 2013) and no doubt more will come from the excellent collections we made. All the fossils in this post came from the Prairie Bluff Chalk Formation (Maastrichtian) exposed at the intersection between Highway 25 and Reed Road in Starkville, Mississippi (locality C/W-395). The specimen is a marine gastropod (fancy name for a snail), which is hard to believe considering no shell is preserved. 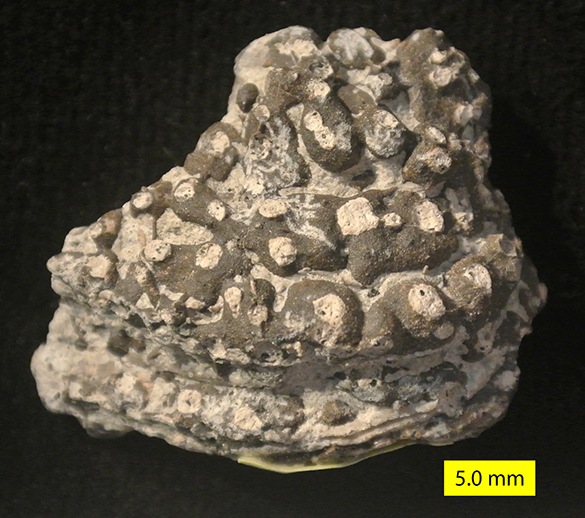 The shape of the original aragonitic shell has been taken by a series of interlocking blobs, each with a sediment-filled tube extending outwards. These are casts of chambers made by a boring clionaid sponge. 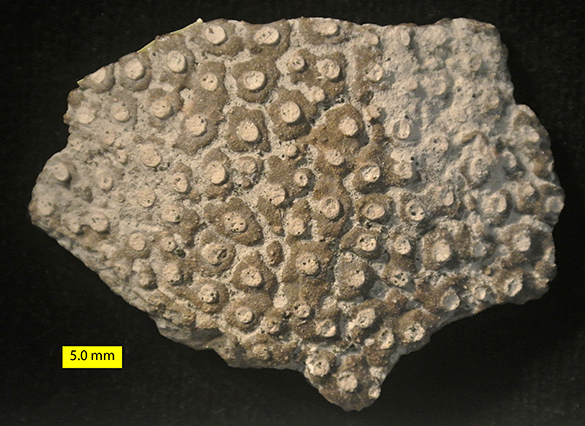 The resulting trace fossil is known as Entobia, a form we have seen several times in this blog. The sequence of events: (1) The sponges excavated cavities connected by tunnels into the aragonite shell of the gastropod, maintaining connections to the seawater for filter-feeding; (2) the cavities and tubes filled with fine-grained calcareous sediment after the death of the sponges; (3) the aragonite gastropod shell dissolved away, probably at the same time the sediment filling the cavities was cemented; (4) the fossil was exhumed as a series of natural casts of the sponge cavities — the trace fossil Entobia. There were many other such fossil ghosts at this locality, such as the apparent bivalve shell fragment above. 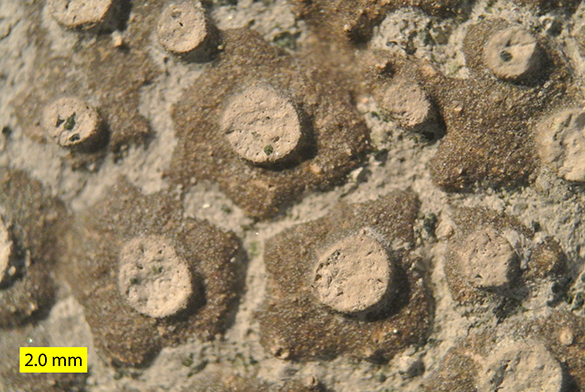 In this closer view (taken with my new extension tubes on the camera) we see some of the interlocking sponge chamber casts. On the surfaces of some you can just make out a reticulate pattern that represents tiny scoop-like excavations by the sponges. In the upwards-extending tubes there are a few green grains of the marine mineral glauconite. As a paleontologist it is always sobering to see a fossil preserved in such an odd way. Were it not for these circumstances of boring, filling and cementation, the shells would have completely disappeared from the fossil record. Every fossil we have, really, is a victory of improbable preservation. Schönberg, C.H. and Shields, G. 2008. Micro-computed tomography for studies on Entobia: transparent substrate versus modern technology, p. 147-164. In: Current Developments in Bioerosion. Springer; Berlin, Heidelberg. Sogot, C.E., Harper, E.M. and Taylor, P.D. 2013. Biogeographical and ecological patterns in bryozoans across the Cretaceous-Paleogene boundary: Implications for the phytoplankton collapse hypothesis. Geology 41: 631-634. Sohl, N.F. 1960. Archeogastropoda, Mesogastropoda, and stratigraphy of the Ripley, Owl Creek, and Prairie Bluff Formations, p. A1-A151. In: Late Cretaceous gastropods in Tennessee and Mississippi: U.S. Geological Survey Professional Paper 331-A.